In recent weeks, Iran has been ratcheting up pressure on the International Atomic Energy Agency (IAEA), accusing its inspectors of spying and sabotage, and threatening to further restrict the agency's access to its nuclear facilities. The target of the regime's finger pointing has typically been Israel and the United States. Its new focus on the IAEA likely reflects a continuation of its current strategy, namely, to keep stalling for time as unending diplomatic rounds continue, all the while continuing to expand its nuclear program. Much of Tehran's decision to focus on the IAEA appears as a response to the agency's latest report, which reveals that Iran has doubled down on its uranium enrichment activities in recent months, doubling the number of centrifuges at its Fordo nuclear site while blocking the agency's access to the Parchin military installation where nuclear-related experiments were believed to be carried out. Meanwhile, Tehran's nuclear enrichment activities have proceeded apace. 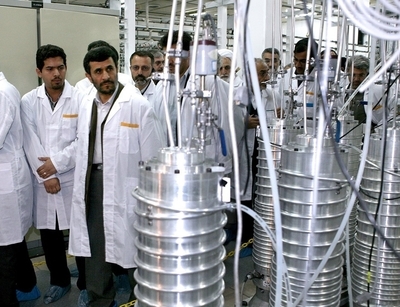 According to Hossein Mousavian, former head of the Foreign Relations Committee of Iran's National Security Council, when the P5+1 talks were taking place in Moscow in June, Iran had not only mastered enrichment to the 20 percent level, but it had domestically produced fuel rods for use in the Tehran reactor, about 10,000 centrifuges, more than 6,000 kilograms of low-enriched uranium (LEU), and 150 kilograms of 20 percent enriched uranium. With diplomatic efforts to bring Iran's nuclear program to heel continuing to fail, American policy toward the Islamic Republic remains problematic. For the first two years of Barack Obama's term as president, U.S. policy sought to reverse Iran's nuclear progress through open dialogue—Obama's outstretched hand and diplomatic engagement based on mutual respect and mutual interests. As it became clear that the U.S. and Iran have divergent interests with respect to their nuclear program, the White House jettisoned that approach and imposed economic sanctions. But with the mixed messaging coming out of Washington and partially enforced economic sanctions, Iran's leaders remain unconvinced that the U.S. would resort to military force so they're pressing ahead. Although the purpose of the economic sanctions leveled at Iran is to provide more time for diplomacy to work, the Obama administration has sent contradictory messages to the regime that serve to undermine that very effort. In fact, the U.S. currently has no clear policy objectives for Iran's nuclear program. While President Obama has said that Iran will not be allowed to have nuclear weapons, Secretary of State Hillary Clinton stated that U.S. policy "is to prevent Iran from having nuclear weapons capability." The key word is capability. The difference is not mere semantics; it is significant because Obama's policy would allow Iran to enrich and stockpile weapons-grade uranium. The last step necessary to make a nuclear weapon from that point can be carried out secretly and quickly. National Intelligence Director James Clapper also weighed in earlier this year telling the Senate that "Iran has the scientific, technical, and industrial capacity to eventually produce nuclear weapons, making the central issue its political will to do so." Adding to the administration's messaging mess are the frequent comments made by senior U.S. officials stressing that there is no clear evidence that Iran has decided to make a nuclear weapon. How, then, does the current administration measure nuclear capability? If the administration believes that Iran has not yet decided to build a nuclear weapon, is Iran's nuclear program even seen as a problem? All of this should be seen in a context where the United States used to accept zero percent enrichment from Iran and previously worked to pass six United Nations Security Council resolutions calling for it to suspend its nuclear enrichment program in toto. Despite those UN resolutions, Western powers appear ready to grant Iran's Supreme Leader, Ayatollah Khamenei, the right to enrich uranium to 5 percent. According to Olli Heinonen, former deputy director of the IAEA, enrichment to 5 percent would put Iran two-thirds of the way toward making weapons-grade uranium. If the West draws a new enrichment red line at 20 percent, it would leave Iran with 13,000 pounds of LEU, which is enough to make five nuclear weapons. Tehran would then be free to process its 5 percent stockpile and continue its centrifuge development. The regime would also be able pursue nuclear arms development through several easily concealable and compartmented programs. And it could do so without any formal weapons program. The key is not playing with enrichment percentages; it is preventing Iran's production of centrifuges. Each red line offered by this administration has been pink and the Iranian regime has yet to be presented with the kind of repercussions that would induce a lasting change in behavior. This creates a credibility problem for the U.S. when it claims that there will be consequences for continued Iranian intransigence. Indeed, President Obama's crossed signals extend not just to Iran but to Israel as well. Following reports in the media would lead one to believe that U.S. and Israeli objectives vis-à-vis Iran are different, as the lion's share of U.S. messaging is devoted to preventing Israel from attacking Iran's nuclear facilities, rather than preventing Iran from gaining a nuclear weapons capability. President Obama's formulation, where "all options are on the table," or Leon Panetta's formulation, where if Iran develops a nuclear weapon, Washington would "take whatever steps necessary to stop it" are not credible when both Panetta and Joint Chiefs Chairman General Martin Dempsy publicly state how problematic a U.S. attack on Iran would be, let alone an Israeli attack. The U.S. military deterrent is further compromised when Defense Secretary Panetta emphasizes that a military attack would be "really destabilizing" and "of greater concern to me are the unintended consequences." The truth, however, is that setting a red line is a tool of diplomacy that can create stability and avoid possible conflicts. It provides a context for negotiations. Yet Barack Obama's insistence that "time is not unlimited" while publicly pleading for Israel's patience is a far cry from a red line. From Iran's perspective, the threat of military force is not credible when Mr. Obama's red lines are not fixed and his administration disparages the effectiveness of a military strike, while belittling Israel's security concerns by likening its unease to "noise." The core of President Obama's effort to sanction Iran is the Comprehensive Iran Sanctions, Accountability and Divestment Act of 2010 (CISADA), which expanded the scope of existing sanctions to cover refined petroleum products, a wide range of financial transactions, and abuses of human rights. The White House followed the move with several Executive Branch orders and Treasury Department designations targeting Iran's Revolutionary Guards, prohibiting international financial institutions from conducting transactions with Iran's central bank, and taking aim at Iran's petrochemical sector. In March 2012, American and European pressure led the Society of Worldwide Interbank Financial Telecommunication (SWIFT) to blacklist scores of Iranian banks, essentially cutting the country off most international commerce. Also in mid-2012, the European Union went ahead with its ban on importing Iranian oil, which until then accounted for almost a fifth of Iran's crude exports. Collectively, the sanctions have impacted Iran's economy. President Obama is fond of proclaiming that his administration passed "the toughest sanctions ever imposed on the Iranian government." But while they are extensive, they remain under-enforced and are only crippling the Iranian people—not the regime. Iranian President Mahmoud Ahmadinejad's fiscal policies have also greatly exacerbated Iran's already dire economic situation. Iranian currency has been dropping like a stone since September 2010, losing more than 80 percent of its value. As Patrick Clawson of the Washington Institute of Near East Policy explained, the official consumer price index in August saw a dramatic 23.9 percent increase over the previous year with the sharpest rise associated with food products, such as a 74 percent increase for both chicken and fresh fruit, and an 81 percent increase for vegetables. But it would be a mistake for Washington to claim credit for Iran's financial woes. As Iran's Majlis speaker, Ali Larijani, revealed in July, "The country's economic problems are only 20 percent due to sanctions. Unfortunately, the main origin of inflation comes from the maladroit application of the plan to suppress subsidies." However one applies blame, there are both external and internal reasons for Iran's economic crisis and relying on economic sanctions alone to affect the regime's thinking when it comes to its nuclear program would be foolhardy. Given Tehran's crushing response to the thousands that gathered in 2009 to protest the fraudulent presidential elections, it is clear that the well-being of the Iranian people is far less a consideration than maintaining the stability of the regime—a position that it views as greatly enhanced and insulated from foreign threats if it possesses nuclear weapons. "As a result, they have repeatedly shied away from truly imposing harsh economic penalties on Iran's trading partners. The countries and companies that serve as Iran's economic lifeline thus haven't truly been asked to choose between their dealings with Iran and their relationship with the United States. And because they haven't, these entities continue to harbor a "business as usual" approach to the Islamic Republic… Instead, leery of roiling relations with vital international trade partners and worried about imperiling America's fragile economic recovery, the Obama administration has shied away from seriously harnessing the economic tools at its disposal… The end result is a U.S. sanctions regime that, while robust on paper, is flimsy in practice—systematically underutilized by an Executive skittish over its potential adverse consequences." The structural problem in America's current Iran policy persists in that the Obama administration often confuses tactics for strategy. Sanctions are a tactic; they are not a strategy in and of themself. For sanctions to be effective in modifying the behavior of the Iranian regime they have to be combined with other tactics such as military, messaging, and ideological components. Moreover, most evidence suggests that sanctions grow less effective over time. The only way they could succeed is if the people in Iran rise up to depose the regime. And that will require a different approach than the policy President Obama promulgated in 2009, when he stood by as the Iranian regime brutally crushed the opposition. With a non-credible military threat, confused messaging, and a growing credibility gap, under-enforced economic sanctions have become the centerpiece of the Obama administration's deterrent strategy. And that will likely leave the Iranian regime undeterred.